← What kind of “-ist” am I, anyway? I read Quiet and saw Susan Cain’s TED Talk, both are very insightful. What’s interesting is I have always stated that I’m an introvert and my wife would not believe me. She is definitely and extroverted personality but after reading a few passages from this book, she’s starting to believe me and find some introverted tendencies within herself. It is a great book and a great post! I adored that book too Melanie! I’m trying to get my partner to read it so that he won’t be so hurt when I say, “I love you now PLEASE be quiet! !” I’m taking it to my Mom to read this week. And I’ll give her permission to pass it on to Sandy when she’s done. Thank you for sharing my little introvert film. 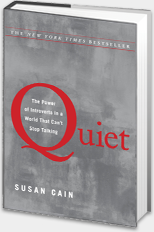 The introvert experience is getting lots of press and newfound awareness thanks to Susan Cain. Despite our loner stereotype, it’s nice to know we are not alone in our need for low stimulation and quiet. I’ve always been fascinated by what’s inside people. Learning about the nature of introverts should keep me in awe forever. I’m an introvert all the way but that doesn’t make me a dark character or a dark writer as many people imagine. In my writing and my blogging I’m free to be the complete opposite if I wish, I just don’t have to worry about the proximity to others. I refer to myself as antisocial though I’m really not, it’s a case of being uncomfortable in social situations and wishing myself elsewhere. The interwebz are great for that 🙂 I’ve always maintained that I come off better in writing than I do in person. That’s changed a bit over the years, as the job has encouraged me to become a good actor (it’s only acting!) but I still recognize that my extroverted side is a mask I wear. I’m happiest at home. Thank you for the pingback but also for the articles about the introverted writer, they’re great! Glad you enjoyed the book. It’s so refreshing to read something validating like that, isn’t it? Thanks for stopping by, Brainy.